Happy Friday and Merry Christmas, Mary Anne here with my final Christmas card for the year. For this last card, I wanted to do something very different for me, A non-colored card. I did use color but a little differently. 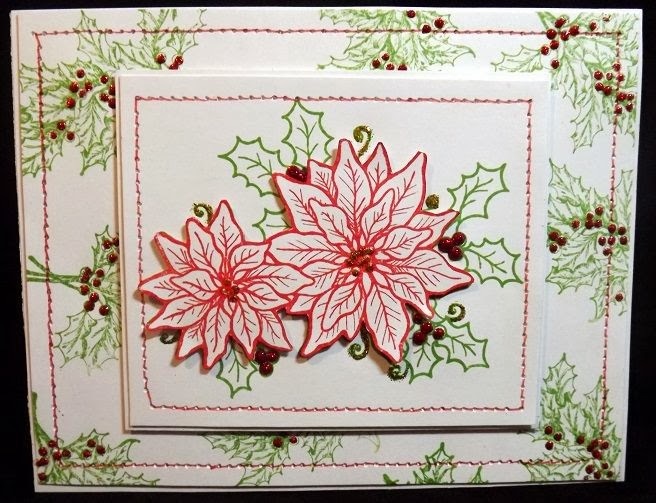 What I did was stamp Vintage Holly H190 for my background and then I stamped K40 Poinsettias and Berries in green for my focal image and in red. Next I cut out my red poinsettia and popped it over the green poinsettia. The two different layers are faux stitched with red to echo the red poinsettia. Finally, I added some red Stickles to all the holly berries on both layers and some gold Stickles to the center of the poinsettias and the swirls around the flowers. As I said before, this card is very different for me without the coloring but, I think the red and green against the white is really striking.